Obviously, I am a writer. Obviously. You’re reading something I wrote right now. I write a wide variety of works, everything from poetry to book reviews. I’ve published a novel and create unique curriculum resources. I even write in the world of fan fiction. I will be the first person to champion free-form, creative writing. In fact, I am not a huge fan of strict structure in most writing (have you ever actually tried to write a sonnet?). So, why would someone like me resort to teaching formulaic writing in my classroom? I’m not talking about “beginning, middle, end” structure. I’m talking about essentially fill-in-the-blank templates for students. It might seem counter-productive. I’ve even had other teachers side-eye me when they hear or see what I do. Heck, I’ll be honest, the first time I saw this type of writing instruction, I side-eyed it. But I have my reasons. I have taught 7th, 9th, 10th, and 12th grade ELA (in that order). Every single grade level I have taught I kept hoping it would get better. I kept hoping that my students would come to me as good writers and I could take their writing and help them soar. I wanted to take them from good to great. I wanted them to enter contests and win scholarships. I wanted them to score straight 6’s on the state writing test. But for 3 years, my 7th graders demonstrated over and over their inability to form a coherent paragraph (some even struggled with a coherent sentence). When I moved up to high school, I was sure the students would have more basic skill. I was wrong. I started my formulaic writing in middle school and continued it in high school for 1 simple reason: I had to. Well, finally, I said enough was enough. No one should not know what to write unless they’re halfway through a novel and can’t figure out how to relate a once-vibrant subplot to the theme. The prompts that the vast majority of my students were asked to write on were no cause for this answer. They didn’t require endless wells of creativity. They required some basic grasp of the main writing traits: structure, conventions, and ideas (I know there are 6 writing traits, but for students who typically hand in a blank sheet, even just getting 3 three under control is a major accomplishment). The vast majority of my students will not only likely never be published authors, but also don’t have any desire to be. I just had to figure out a way for them to live within their reality. I had to figure out a way to help them demonstrate some sort of mastery of the basics. If I could do that, then I could consider myself successful. And so my formulaic writing was born. I began with my lowest students and created the skeleton essay. This is where I put every structurally required element in for them and they only had to come up with quasi-coherent content. I began with the three basic paragraphs: introduction, body, and conclusion. I skipped the hook (because face it, you can have a functional essay without one) and wrote the thesis statement for them. I wrote all the transition words and the blueprint for the body paragraph as well as the conclusion paragraph. I started with easy questions. Inflammatory questions. Questions that are in no way related to the higher-order thinking prompts required on state writing tests and SAT and ACT writing portions. But you know what? That’s okay. Starting with the hackneyed, “Should there be school uniforms?” is okay when you’re trying to get a kid from blank-page-head-on-the-desk to turning in something with meaning – something that shows him/her writing is something s/he can do. I started with blueprint, formulaic writing with insanely basic prompts and allowed anecdote after anecdote for “evidence.” I fostered the mentality that “no one cares if what you write is true; the reader cares if what you write is reasonable and related.” Once my students knew the formula and felt “allowed” to (essentially) make up evidence, they had no excuse. There was no room for “I don’t know what to write.” Because now they had a blueprint. They had a formula. They didn’t have to figure out how to start. I began having students who would write absolutely nothing turning in multi-paragraph essays. Not grade-level vocabulary or even sentence-length, but they felt like they had accomplished something. I’ve learned over the course of my teaching career that I have to meet and teach students where they’re at. If I asked my 4-year-old to do Calculus, he’d hop down from the chair after less than a minute and want to go play. He wouldn’t care if it was state-mandated that he demonstrate mastery. He wouldn’t be able to do it. I have had to let go of the idea that I could get every kid performing at or above grade-level over the course of the year. I have seen time and time again that if I teach a student where s/he is at, engagement is higher, motivation is higher, and that student’s achievement is higher. Have I made up for years’ worth of deficits? No, but have I prevented yet another wasted year? I like to think so. If you’d like to see (and perhaps try!) some of what I used to improve my students’ writing, come check out my mini-lesson on writing thesis statements or my writer’s workshop! I wasn’t overly impressed with the quality of the curriculum – as is true for most large curriculum companies, there were errors, lack of explanation for answers, and virtually no guide for teaching metacognition (another research-based instructional component). But I did like, and find effective, the overarching principles of the instructional model. It was on this that I based my own CIM resources. These resources are intended to be used in conjunction with other curriculum, instruction, and assessment. They should be a component of the Continuous Improvement Model within any classroom. They should be used to help the teacher gather data on student comprehension and achievement and that should drive further instruction. This particular CIM targets the Common Core Reading: Literature Standard 1 for grades 9-10. It has a complete teacher script for lesson 1, which models metacognition for students and goes through how to determine the correct answer for the correct reason. It has a guided lesson script for lesson 2, which helps take students through the same process before trying it completely on their own in lesson 3. 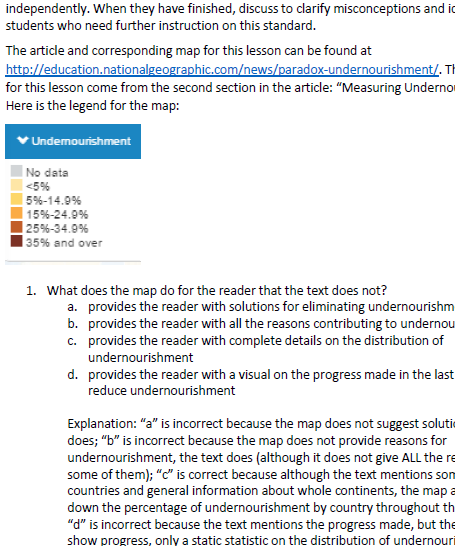 Although, lesson 3 has thorough explanations for the correct and incorrect answers so that it can be a part of the Continuous Improvement Model process. Additionally, it offers differentiation options by having two complete sets of lessons: one using multiple-choice questions and one using open-response questions. This resource combines 2 essential features of quality education: effective use of time and best-practices teaching methods. Finding supplementary materials that specifically target a single standard are difficult to come by. You either have to take a resource and pick it apart to use only the questions that apply to the standard you’re targeting or you have to make it yourself. And few teachers have the time (or inclination, for that matter) to pick passages and write standards-based questions for them. This takes that prep-work piece away and does that labor for you. However, you, as the teacher, get to decide how to use the resource, how to differentiate and scaffold it, and even whether or not to use pairs or small groups – all while knowing you are engaging your students in the model-guide-practice research-based teaching strategy and gathering information and data you can use as a part of your classroom’s Continuous Improvement Model. Although this is my first CIM for this level, I have a complete RL/RI (all 17 standards) CIM set for 6th grade and I’m almost halfway done with the complete 8th grade set as well. Eventually, the intention is to have sets for grades 5, 6, 7, 8, and 9-10. How can you use this resource effectively? Many teachers who have purchased from my CIM line use this resource as bell work. Others use it as a part of a focus workshop. The product itself has suggestions for differentiation as well as collaborative work. On July 16, 2016, Catherine R. said: This will be a valuable resource to walk students through the process of reading and using evidence to respond to questions. Thanks for sharing. On July 13, 2016, Wacky Apple (TpT Seller) said: Exactly what I needed. On June 7, 2016, Rebecca Harris (TpT Seller) said: Excellent resource! I look forward to using these with my students this year! On April 21, 2016, Janine L. said: Looking forward to using these to review the standards my students performed poorly on for their district assessments. On January 24, 2016, Crystal V. said: I own the RL bundle and the RI bundle. Yes, they are a little bit pricey but I think it is absolutely fair considering the amount of content. You definitely get what you pay for! I love using these as Bell Ringer Activities, and to remediate standards since testing is coming up. Thanks! On November 20, 2015, Shakera W. said: Thank you! this resource is so helpful for intervention! Thank you so much! Very thorough resources! On October 14, 2015, Shakera W. said: Great intervention tool! Thank you! If this sounds intriguing, head on over and check it out! It’s hard to get kids on board with reading non-fiction. Fortunately, there are websites out there with kid-friendly articles that are topical and approachable. It was these websites I went to when I needed to find non-fiction, informational text to create my Continuous Improvement Model mini-lessons for CCSS.ELA.RI.6.7. This CIM has 3 different mini-lessons designed to take about 10 minutes each. Every lesson has 2 questions to help students practice this standard. I was able to find appropriate non-fiction, informational text on www.timeforkids.com and also on http://kids.nationalgeographic.com. What’s great about this resource is that it ONLY targets the standard RI 7 (Reading Informational Text 7). All the other practice out there that I have seen has multiple standards, which is great if you’re doing summative work or have lots of time to go over every single standard with the students, but if you are wanting practice that pinpoints a single standard, mine is the only thing I’ve found like it. Mine also has scaffolded practice, which is the only resource I’ve ever seen with that as well. Other practice out there tells which answers are right and why, but mine has 3 separate lessons that follow the “I do,” “we do,” “you do” model so students are scaffolded on their journey to mastering the standard. It even includes a script for teachers for the first and second lesson, along with detailed explanations on answers for the third lesson, in case the teacher needs to re-teach/explain. This CIM is targeted for RI6.7, but because of how Florida redid their standards, it is also applicable for LAFS.6.RI.3.7. If this sounds like something you could use with your 6th graders, you can check out the free version (RL.6.1) and then go from there. Otherwise, you can go straight to the CIM for RI.6.7 here. I’ve been MIA for a while because I grossly underestimated how much work it would be to go back into the classroom! But I put in a lot of work into making my Continuous Improvement Models (CIMs) for RI.6.4-6 (Author’s Craft & Structure) so I really wanted to post about it. I just want to give an overview of the CIMs in the bundle and explain to you why you should be interested in my resources if you teach upper elementary/lower middle English/Language Arts. I’ve been working on my CIM for RI.6.7 and I was having trouble finding texts and even looking for resources with sample questions to make sure that my resources are valid and on point with the standards and other resources out there. Well, I started realizing there weren’t any resources out there that target individual standards. Sure, there are lots of things out there for teachers that have texts and questions for Common Core, but everything I’ve found gives teachers a handful of questions that target multiple standards. For example, I might get 7 questions, but each one only targets 1 standard, so I really only get 1 – or maybe 2 – questions on any given standard. And nothing I’ve found uses the format I do – the “I do,” “we do,” “you do.” And none of the resources I’ve found give teachers the tools to work through teaching students how to correctly identify answers for the given questions. Everything I’ve found only identifies which standard the question assesses and the correct answer. Sometimes it will have reasoning for why it is the correct answer, but nothing more than a few sentences. My resources are much more in depth. There are 3 mini-lessons for an individual standard. In this particular bundle, each individual lesson has at least 2 questions. For lesson 1, there is a full script that explains, in depth, how to determine the correct answer(s). In lesson 2, there is a script to guide students through determining the correct answer(s) themselves. In lesson 3, there is ample explanation on why the incorrect answers are incorrect and why the correct answer is correct, in case students need re-teaching or explanation. If this sounds like something your students could use, check out my newest bundle for Reading Informational Text Grade 6 standards 4, 5, & 6. When I started working with teachers two years ago upon CCSS roll-out in our state (which was slapped, tickled, and relabeled LAFS – Language Arts Florida Standards), it became clear there was going to be a void. Teachers I worked with and spoke to became nervous that there weren’t enough practice materials for students to master the new and more rigorous standards. 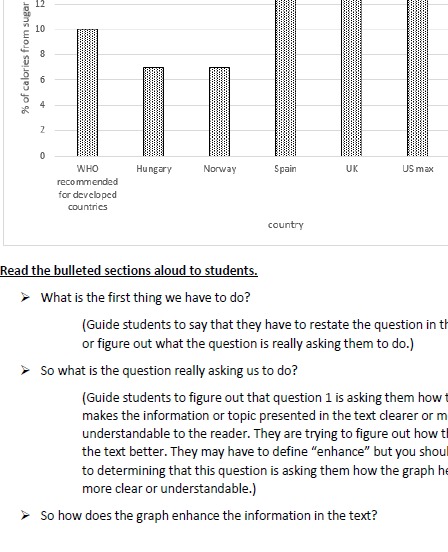 I began creating resources for them, such as question stems, and they gave great feedback. As time went on, though, and the new state tests loomed on the horizon, I began to see that students in my district weren’t going to get enough test preparation. This was a function of the curriculum our district uses in English/Language Arts. I won’t elaborate beyond saying that it is completely void of any real, consistent, useful traditional assessments and how the curriculum potentially relates to what the students will see and be expected to demonstrate mastery on when they take the state assessment. I figured that if this was the case in my district, it was probably true in others. Based on this assumption, I began creating my CIM line. CIM stands for Continuous Improvement Model. It is based on the “I do,” “we do,” “you do” model of instruction. Students get three rounds of practice – once at the teacher level, seeing the metacognition that goes on during the problem-solving process; then in a guided setting, where the teacher can begin to see the areas needing focus and re-teaching; and finally, independently, demonstrating mastery or lack thereof. For those of you not familiar with the term CIM, I didn’t invent it. It comes from the reading curriculum our district uses, except we call them FCIMs – the “F” standing for (no, not that F word) Florida. Since the LAFS correlate pretty much identically with the ELA Common Core Standards, I just dropped the “F” and my CIMs are designed to help any student in a state with either Common Core or LAFS – or a state who did the same thing Florida did and just put a brand new coat of paint and called it a horse of a different color. I’ve gotten good feedback from these lessons, so I’ve continued my quest to fill the void. I’ve done almost all of 6th grade Reading Literature standards CIMs (putting the finishing touches on RL.6.7…it should be ready by next Sunday) and have started on the 6th grade Reading Informational Text standards CIMs. 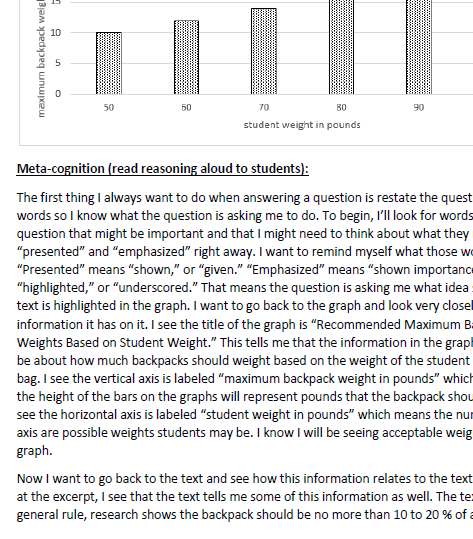 That’s what this post highlights: RI.6.2 (central idea and summarizing). This resource has three lessons. Lesson 1 is a scripted teacher lesson that presents questions and a passage, along with commentary and reasoning for students to hear the process aloud to see how the teacher arrived at the answers. Lesson 2 is a guided practice lesson where the teacher helps students reason and analyze their way to the correct answers with a little help here and there. Lesson 3 is an independent lesson where students must demonstrate that they can come to the correct answers on their own. The results of Lesson 3 dictate either re-teaching or moving onto the next concept. These resources aren’t units and they aren’t meant to be stand-alone products. They’re designed to be more like bell work or class starters. They’re only supposed to take about 7-10 minutes each. My plan is to have a full line of RL and RI CIMS for grades 3-11 (I’m not sure 12th grade would have much of a demand, since most states stop testing in either 10th or 11th grade), so you’ll periodically see blog posts from me about the newest CIM I’ve added to the line. I have a free version you can test out if you think this might be something your students could use. The good news is that if you’re at all familiar with Common Core or LAFS you’ll know that the secondary standards are remarkably similar, so if you have some students who aren’t quite reading on grade level, the 6th grade series might be a good place to start to build some confidence. Of course, if you use it and you like it, leave some feedback and rate the product. It helps me reach my goals and improve my products. Thanks!